Leighton Mills is a man on the way up — until an incident with too many glasses of champagne, a randy junior British Royal, a limo's back seat and a paparazzi photographer. Now Leighton finds himself diplomatic attaché to the nondescript villa that is the Auckland embassy of The Most Royal Kingdom of Fe'ausi. Fo'alafa Day, the Feausian equivalent of April Fool's Day, gets off to a cracking start with consulate 'babysitter' Leighton hosed down after a hoax anthrax-in-the-mail scare perpetrated by Suga, officially the consulate's tourist affairs liaison (but unofficially a bit unhinged and a lot scary). Leighton's suffering is brought to an end only when the object of his adoration, Leilani, arrives and tells them to leave him alone. Leighton then has the duty of reporting that Cyclone Joseph, which was going to miss the Fe'ausi Islands, has turned south and is heading straight for Ma'akiaveli, the capital city. When Leighton reveals this to be a prank, Fo'alafa Day takes another turn. Jonah reveals that they all knew it was a prank — but that Cyclone Joseph has actually turned a bit south and is heading for Fa'a'fele, an outlying Fe'ausian island, home to a colony of lepers and the nuns who look after them. Now just who is pranking who here? In an attempt to buy Leighton off with the baubles of power, the Fe'ausians want to make him the first ever non-Fe'ausian Aratika (high chief). Unfortunately for them, Leighton has been reading his MC Hamer (the German anthropologist and expert on Fe'ausian customs) so he is only too happy to accept their offer because he knows being an Aratika will give him direct access to the King on matters where the good name of Fe'ausi is being besmirched. Unfortunately for Leighton, Mick unearths an appendix to the MC Hamer which outlines the gruesome and humiliating rituals prospective Aratikas used to have to undergo. Jonah decides it is high time these rituals made a comeback. Leighton arrives at the consulate to find it in the throes of wedding preparations for members of a polygamous quasi-religious sect as well as Leilani's arranged marriage to Prince Toomai of the kingly Kingdom of Fa'akofa. 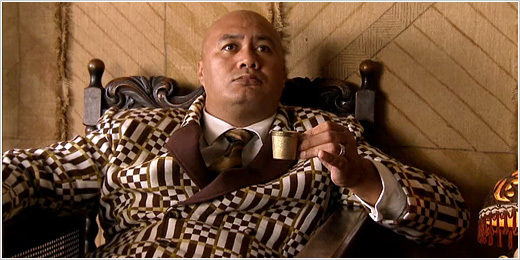 In the wake of Leilani's cancelled marriage to Prince To'omai, Fe'ausi has declared war on Fa'akofa. Leighton does his best to stop the escalation of hostilities between the two proud island nations. The arrival of this week's diplomatic pouch in the less than capable hands of Niu, Fe'ausi's surfing legend, brings with it not just the usual contraband but something much more unpleasant. For once it is Leighton who must try to save the Fe'ausians from their own greed, as they plan to sink all the money they have made from phosphate mining Kakapu Atoll into an extremely dodgy West End musical. 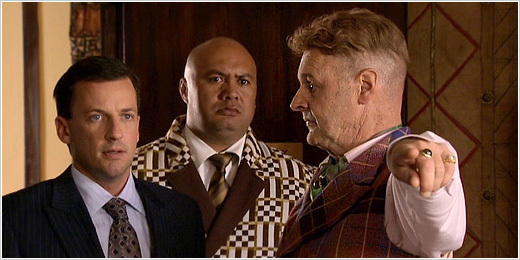 Of course, most of the staff at the Auckland embassy of The Most Royal Kingdom of Fe'ausi get bitten by the theatrical bug and want roles in the musical, whose show-stopping numbers include, naturally, a big fat finale called Knocked The Bugger Off. The annual Frangipani Festival showcase of Pacific Island culture gives Leighton the chance to book his ticket out of his Fe'ausian consulate hell. An anti-whaling protestor chains herself to the consulate gates; meanwhile, out the back of the consulate in Mick's hiding shed, there are many cans of corned whale waiting to be exported to Japan. Leighton gets a blast from the past as Princess Grace — the reason he was consigned to the Fe'ausian consulate — drops in for a surprise visit, after coming out of her latest stint of rehab. Jonah has a new woman in his life — Svetlana. But Is Jonah being played, and has he become the victim of a honey trap? The King has listened to the evil Royal Nutritionist and has gone on a diet — which means that every Fe'ausian must go on the same diet — and it's Vegan. The War on Terror comes to Fe'ausi as Bumabuma Day, the Fe'ausian equivalent of Guy Fawke's Day, looms.